CORRECTION: This story corrects a previously stated misinterpretation of the NASA Senior Report that the WISE spacecraft itself was denied an extension. NASA has denied funding to an idea to use NEOWISE image exposures for additional processing for science purposes, according to Amy Mainzer, the deputy project scientist for the Wide-field Infrared Survey Explorer (WISE) at NASA’s Jet Propulsion Laboratory. The project, called MaxWISE, was supposed to run for three years and to use NEOWISE data for other purposes. things that vary on different timescales,” Mainzer said in an interview Friday (May 16) with Universe Today. Its goals would have included measuring the motions and distances for stars and brown dwarfs near the sun, examining variable stars and setting up a “transient detection and alerts program” for certain astronomical phenomena. In its review, the panel said it was “concerned that the proposed transient detection program would yield little science considering how much it cost”, and approved the program at half of the budgetary levels originally requested. NASA, however, wrote that it would decline the proposal altogether. “The MaxWISE proposal was recommended for selection by the senior review. However, the only source of funding would be to displace funding from higher rated operating missions in the senior review. Due to constrained budget conditions, the MaxWISE proposal is declined,” NASA wrote in its response. “It’s tremendously disappointing,” Mainzer said of the decision, adding it is a tough NASA budget environment overall. She is encouraging people to get in touch with their elected representatives if they want to see changes. 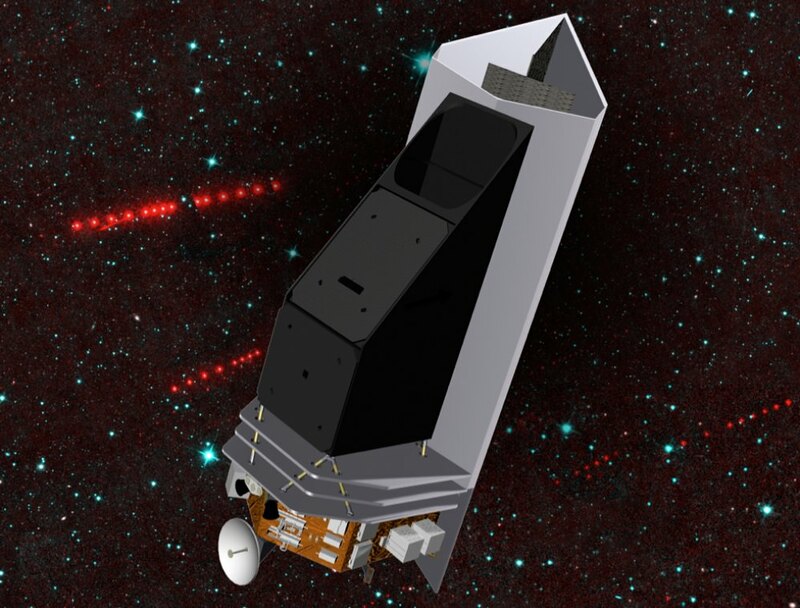 Other approved missions included a Kepler space telescope repurposing and extended operations for the Hubble and Chandra telescopes, among other missions. Spitzer officials were declined their request and asked to send a revised budget for consideration in fiscal 2016 negotiations. WISE J104915.57-531906 as seen in NASA’s All-WISE survey (centered) and resolved to show its binary nature by the Gemini Observatory (inset). (Credit: NASA/JPL/Gemini Observatory/AURA/NSF). After its launch in 2009 and successful prime mission, WISE was put into hibernation in 2011 before being turned on again last summer to look for asteroids that could pose a threat to Earth, and possibly to participate in NASA’s asteroid mission by looking for a space rock that could be captured and explored. NEOWISE is expected to run until about 2016 or 2017, depending on how active the Earth’s atmosphere becomes. Since the spacecraft is in a relatively low orbit of 311 miles (500 km), if the sun’s activity increases molecule interactions in the atmosphere and expands it, the spacecraft can be somewhat twisted out of its orbit. Also, more scattering can occur. Both would make it harder for the spacecraft to carry out its mission, Mainzer said. In the meantime, amateur astronomers can follow along with one of NEOWISE’s recent discoveries: the spacecraft recently found a fairly large near-Earth asteroid, about 1.24 miles to 1.86 miles (2 to 3 km) in size. It’s called 2014 JH 57 and you can get more orbital parameters on it at this page after typing in “2014 JH57” (no quotes) into the search bar. You can read more about the senior review here. In its former life NASA’s WISE (Wide-field Infrared Survey Explorer) spacecraft scanned the entire sky in infrared wavelengths. It helped discover the galaxy’s coldest stars, the Universe’s brightest galaxies, and some of the darkest asteroids lurking in the main asteroid belt between Mars and Jupiter… as well as closer in to Earth’s neck of the woods. After exhausting its supply of liquid coolant needed to shield itself from its own radiating heat, in 2011 WISE was put into a state of hibernation. It was awoken last year and rebranded NEOWISE, and set upon the task of locating unknown objects with orbits in the proximity of Earth’s. To date several new asteroids have already been found by NEOWISE, and on February 14, 2014, it spotted its first comet. Designated “C/2014 C3 (NEOWISE),” the comet was 143 million miles (230 million km) away in the image above — a composite made from six infrared exposures. That’s 585 times the distance to the Moon, or about the average distance between the Earth and Mars. The tail of the comet NEOWISE extends about 25,000 miles (40,000 km) to the right in the image. Overall, C/2014 C3 (NEOWISE) was spotted six times before it moved out of range of the spacecraft’s view. The comet has a highly-eccentric 20-year orbit that takes it high above the plane of the Solar System and out past the orbit of Jupiter. Technically, with a perihelion distance greater than 1.3 AU, comet C/2014 C3 does not classify as a near-Earth object (and its orbit does not intersect Earth’s.) But it’s still good to know that NEOWISE is looking out for us. Read more on JPL’s NEOWISE site here, and see details on the comet’s orbit on the Minor Planet Center’s website here and from JPL’s Small-Body Database here. Weekly Space Hangout – January 31, 2014: No Black Holes?!? In perhaps the neatest astronomical application of geneology yet, astronomers found 28 “hidden” families of asteroids that could eventually show them how some rocks get into orbits that skirt the Earth’s path in space. From scanning millions of snapshots of asteroid heat signatures in the infrared, these groups popped out in an all-sky survey of asteroids undertaken by NASA’s orbiting Wide-Field Infrared Survey Explorer. This survey took place in the belt of asteroids between Mars and Jupiter, where most near-Earth objects (NEOs) come from. NEOs, to back up for a second, are asteroids and comets that approach Earth’s orbit from within 28 million miles (45 million kilometers). Sometimes, a gravitational push can send a previously unthreatening rock closer to the planet’s direction. The dinosaurs’ extinction roughly 65 million years ago, for example, is widely attributed to a massive rock collision on Earth. Part of NASA’s job is to keep an eye out for potentially hazardous asteroids and consider approaches to lessen the threat. There are about 600,000 known asteroids between Mars and Jupiter, and the survey looked at about 120,000 of them. Astronomers then attempted to group some of them into “families”, which are best determined by the mineral composition of an asteroid and how much light it reflects. While it’s hard to measure reflectivity in visible light — a big, dark asteroid reflects a similar amount of light as a small shiny one — infrared observations are harder to fool. Bigger objects give off more heat. This allowed astronomers to reclassify some previously studied asteroids (which were previously grouped by their orbits), and come up with 28 new families. “This will help us trace the NEOs back to their sources and understand how some of them have migrated to orbits hazardous to the Earth,” stated Lindley Johnson, NASA’s program executive for the Near-Earth Object Observation Program. The astronomers next hope to study these different families to figure out their parent bodies. Astronomers believe that many asteroids we see today broke off from something much larger, most likely through a collision at some point in the past. While Earthlings will be most interested in how NEOs came from these larger bodies and threaten the planet today, astronomers are also interested in learning how the asteroid belt formed and why the rocks did not coalesce into a planet.